Diabetic nephropathy is a major cause of ESRD worldwide. Despite its prevalence, a lack of reliable animal models that mimic human disease has delayed the identification of specific factors that cause or predict diabetic nephropathy. The Animal Models of Diabetic Complications Consortium (AMDCC) was created in 2001 by the National Institutes of Health to develop and characterize models of diabetic nephropathy and other complications. This interim report and our online supplement detail the progress made toward that goal, specifically in the development and testing of murine models. Updates are provided on validation criteria for early and advanced diabetic nephropathy, phenotyping methods, the effect of background strain on nephropathy, current best models of diabetic nephropathy, negative models, and views of future directions. AMDCC investigators and other investigators in the field have yet to validate a complete murine model of human diabetic kidney disease. Nonetheless, the critical analysis of existing murine models substantially enhances our understanding of this disease process. Diabetes is the major cause of ESRD in the United States and elsewhere, and its incidence has increased by >50% in the past 10 yr.1 Despite this disturbing trend, only a minority of individuals with either type 1 or type 2 diabetes develop nephropathy, indicating that specific environmental or genetic factors must contribute to its initiation and progression. Although clear progress has been made in understanding the disease process, there has been limited success in identifying specific factors that cause or even predict human nephropathy and its progression. One of the reasons for the slow evolution in our understanding of diabetic nephropathy is the lack of reliable animal models that mimic human disease. Hence, in 2001, the Animal Models of Diabetic Complications Consortium (AMDCC) was initiated by the National Institutes of Health to develop and characterize such models to enhance the development and testing of effective therapies and preventive strategies for diabetic nephropathy and other complications. Although the primary goal of the consortium—to develop murine models of diabetic micro and macrovascular complications that completely replicate the human diseases—has not yet been attained, much progress has been made in model development, mouse phenotyping, strain analysis, and understanding of pathogenesis of diabetic complications. In 2005, the nephropathy subcommittee of the AMDCC published an account of phenotyping standards, validation criteria, and observations about currently available murine strains and models of diabetic nephropathy.2 That article set the standard for phenotyping methods of mouse models and for diagnostic criteria of early and progressive diabetic nephropathy. These standards were valuable to the field and, as of June 2009, that article had been cited 85 times in the biomedical literature.3 Since that article was published, the AMDCC investigators studying nephropathy have established more detailed validation criteria for phenotyping murine models of diabetic nephropathy and a number of exciting new models that replicate various features of the human disease. Conversely, several initially promising models develop little or no nephropathy. A number of new approaches to the study of diabetic nephropathy have emerged since the 2005 publication. The purpose of this article is to summarize these new observations and advances. One of the first issues for the AMDCC was to define criteria for validating murine models of human diabetes and diabetic complications. These validation criteria are available on the AMDCC web site (http://www.amdcc.org). The criteria for nephropathy have been modified recently and are listed in Table 1. AMDCC investigators conclude that, although an ideal model of diabetic nephropathy would display all of these criteria, no current model meets them all. The criteria should therefore be viewed as goals rather than requirements. In addition, validation of any model should include reasonable efforts to exclude other types of kidney disease or damage unrelated to that from diabetes. Another early task of the AMDCC was to standardize phenotyping of murine models of diabetic nephropathy so that models could be compared between laboratories within and outside the consortium. These phenotyping protocols were recently updated and are available on the AMDCC web site at http://www.amdcc.org. Current basal phenotyping for diabetic nephropathy includes urinary albumin determination by ELISA and urinary creatinine testing by standard methods on both spot urine and 24-h urine collections. Unfortunately, the albuminuria data from 24-h collections and those from spot samples are not always concordant, with one value sometimes suggesting a greater increase in albuminuria than the other.4 As discussed herein, this discrepancy may be somewhat strain dependent4 and is due in part to variations in creatinine excretion. At present, it is not clear which value is the more accurate indicator of relative changes in albuminuria, and AMDCC investigators recommend reporting both measurements. Measurements of serum or plasma creatinine in mouse models need to be performed by HPLC, liquid chromatography/tandem mass spectrometry,5 or a similar detection system because the Jaffe alkaline picrate method overestimates creatinine levels by three- to five-fold in plasma of mice.6–8 Also, it is important to recognize that the enzymatic assay of creatinine used in clinics, which converts creatinine into creatine, should not be used for mouse urine because mice excrete significant amounts of creatine in their urine.9 When measured by these more definitive assays, normal mouse serum creatinine values are in the range of 0.08 to 0.11 mg/dl, as opposed to 0.40 to 0.60 when measured by the Jaffe method. Many facilities (including some mouse metabolic phenotyping centers) use an autoanalyzer enzymatic assay based on creatinase activity. In normal mice, this method overestimates creatinine values approximately twice that of HPLC-determined values (i.e., approximately 0.2 mg/dl).10–12 Autoanalyzer values are also susceptible to underestimation of creatinine in the presence of hemolyzed blood.11 Nevertheless, when assessed together with the blood urea nitrogen, the enzymatic determination of creatinine may be suitable for high-throughput screening of renal function. When the plasma creatinine is elevated, GFR can be best determined by FITC-inulin clearance.13,14 Estimation of GFR by creatinine clearance using HPLC values for creatinine in serum or plasma may not be reliable, because a preliminary report suggested that tubular secretion of creatinine may account for up to 50% of creatinine clearance in some strains of mice15 and the contribution of creatinine secretion to its clearance in diabetes and renal insufficiency is unclear. Renal histopathology includes periodic acid-Schiff staining of kidney tissues for assessment of mesangial matrix expansion and arteriolopathy, tubulointerstitial disease of any type, and general glomerular morphology; however, periodic acid-Schiff–stained tissue does not clearly distinguish between extracellular matrix and cell cytoplasm, and this can confound determinations of altered matrix accumulation. Silver methenamine is a more specific stain for extracellular matrix but is more technically difficult to perform reliably (Figure 1). For models with advanced lesions, a more comprehensive assessment should take place, as noted in Table 2. Mesangiolysis (Figure 2) is a common feature of diabetic nephropathy in humans and should be assessed in mice. In addition, the presence of a concurrent glomerular immune complex deposition process should be excluded by immunofluorescence or immunohistochemical studies of renal tissue in all validated models of diabetic nephropathy. Appearance of four histologic and/or immunohistochemical stains used to characterize the morphologic changes in a 24-wk-old BKS db/db mouse are compared. (A) Jones silver methenamine/hematoxylin and eosin stain shows expansion of mesangial matrix (black stain) and clear depiction of cellularity (cell nuclei). This stain also clearly delineates basement membranes and allows good definition of capillary loops versus mesangial structures. (B) Periodic acid-Schiff (PAS) stain. Like the Jones stain depicted in A, this stain shows good delineation of basement membranes and capillary loops as distinct from mesangial regions. Expanded mesangial regions are well detected by this stain. Compared with the silver methenamine stain, some cellular detail is lost with PAS because the distinction between matrix and cell cytoplasm can be obscured as a result of staining of carbohydrate structures in both compartments (see Figure 2). (C) Hematoxylin and eosin stain. This stain is valuable for identifying overall cellularity but is unsatisfactory for quantification of glomerular matrix changes, particularly when they involve modest expansion of mesangial regions. This stain does not highlight basement membranes well and does not clearly distinguish cellular versus matrix components in expanded mesangial regions. (D) Immunohistochemical staining for collagen IV, with methyl green counterstain. This stain clearly defines increased matrix components within the glomerular tuft and also is a good marker of basement membranes in the interstitium. Overall, Jones silver methenamine, PAS, and collagen IV immunohistochemical staining can be reliably used for morphometric analysis of glomerular changes that involve matrix expansion. When these changes are pronounced and there is greater distortion of glomerular tuft architecture than depicted in this example, the PAS stain may be less reliable than the silver methenamine stain in separating cellular versus matrix contributions to expanded glomerular compartments because of its greater recognition of some cellular components. Morphologically advanced murine diabetic nephropathy demonstrates prominent mesangiolysis. (A) There are broad areas of lucency (arrows) within expanded mesangial regions. Mesangiolysis is most easily recognized with a Jones silver methenamine stain, in which the normally homogeneous and compact silver staining (black) matrix (shown in Figure 1A) is disrupted, as indicated by areas of lucency and/or spongiform appearance. (B) In contrast, a PAS stain shows equivalent mesangial expansion, but the demarcation of cellular and matrix components and lytic regions is less distinct with this stain as compared with the Jones stain. The previous AMDCC article2 and two subsequent reports from AMDCC investigators4,16 compared the effects of genetic background on the degree of diabetic nephropathy in a variety of inbred mouse strains. These findings are not repeated here, except to note the relative resistance of the C57BL/6 (B6) mouse to nephropathy and the relative susceptibility of the DBA/2 strain to nephropathy (Figure 3). The inbred strains that develop the most profound diabetic nephropathy, use of outbred strains, and models negative for diabetic nephropathy are described in the online supplement. The Mouse Phenome Database is a useful source for comparative data of basal metabolic parameters distinguishing the more commonly used inbred strains (http://phenome.jax.org/pub-cgi/phenome/mpdcgi?rtn=docs/home). For example, the web site contains albumin-creatinine ratio data for males and females of 30 inbred strains. (A and B) Phenotypic comparison of the Ins2Akita mutation in males of three stocks shows comparable hyperglycemia in Akita/+ males on all three backgrounds (A), but development of early signs of diabetic nephropathy (increased albumin/creatinine ratio) was limited to the DBA/2 strain background (B) when necropsy was done at 6 mo of age. Although some inbred mouse strains are more susceptible to nephropathy than others, no current murine strain of type 1 or type 2 diabetes reliably develops all of the features of human diabetic nephropathy listed in Table 1. AMDCC investigators as well as others outside the consortium have endeavored to augment diabetic nephropathy by genetic breeding and other means in both susceptible and resistant strains of mice. For these efforts, a number of recently described models develop features of human diabetic nephropathy and seem more robust than those in standard models. Many but not all of these new models have been developed by members of the AMDCC. A number of models that AMDCC investigators believe are the most promising are discussed next. To generate a model of type 1 diabetes with deficient eNOS activity, two groups induced diabetes by streptozotocin (STZ) injection in eNOS−/− mice on the nephropathy-resistant B6 background (JAX #2684). Nakagawa et al.24 used high-dosage STZ, whereas Kanetsuta et al.25 used multiple low-dosage injections. Compared with wild-type B6 mice, diabetic eNOS−/− mice develop a 10-fold increase in diabetic albuminuria with low-dosage STZ and a 40-fold increase with high-dosage STZ. Although mice do not develop significant reductions in GFR compared with B6 mice, their GFR is 40% lower than in wild-type low-dosage STZ diabetic mice, because the wild-type mice develop significant diabetic hyperfiltration, which the eNOS−/− mice fail to develop. Finally, diabetic B6-eNOS−/− mice develop significant increases in mesangial expansion, mesangiolysis, and focal sclerosis. In the low-dosage STZ diabetic B6-eNOS−/− mice, both glomerulosclerosis and tubulointerstitial injury develop gradually, whereas high-dosage STZ B6-eNOS−/− mice exhibit earlier and more robust glomerular and tubulointerstitial pathology, even though the blood glucose levels are higher in low-dosage STZ diabetic mice. The high-dosage STZ diabetic mice also exhibit significant hypertension and mortality. It is likely that some of the pathologic changes observed in these high-dosage STZ diabetic eNOS−/− mice reflect a toxic response to STZ rather than diabetic nephropathy per se, and the AMDCC recommends that low-dosage STZ protocols be used for mouse models. Preliminary studies by AMDCC investigators indicate that the B6-eNOS−/−Ins2Akita/+ mice die soon after weaning and therefore do not live long enough to develop diabetic nephropathy (T. Takahashi et al., unpublished observation); however, eNOS−/−Ins2Akita/+ diabetic mice that are F1 between B6 and 129SvEv develop diabetes with similar timing and severity as in B6-eNOS−/−Ins2Akita/+ mice but survive as long as diabetic B6-eNOS+/+Ins2Akita/+ mice. The F1 mice develop diabetic nephropathy similar to B6-eNOS−/− male mice made diabetic by low-dosage STZ and so may also be a useful type 1 model. F1 mice between inbred strains are as genetically uniform as their parents but are more robust because most strain-specific detrimental genes will no longer be homozygous. For generation of a model of type 2 diabetes with deficient eNOS activity, C57BLKS (BKS)-db/db mice were crossed with eNOS−/− mice also on the BKS background26,27 (JAX# 8340). These mice exhibit mild to moderate hypertension as is generally true with eNOS−/− mice on the B6 background. They develop significant albuminuria, decreased GFR, mesangial expansion, glomerular basement membrane thickening, arteriolar hyalinosis, mesangiolysis, nodular glomerulosclerosis, and tubulointerstitial injury that is significantly greater than that found in low-dosage STZ diabetic B6-eNOS−/− mice (Figure 4). Hyperglycemia is first apparent at 6 to 8 wk of age, and mice exhibit full-blown functional and nephropathic changes by 16 to 20 wk. 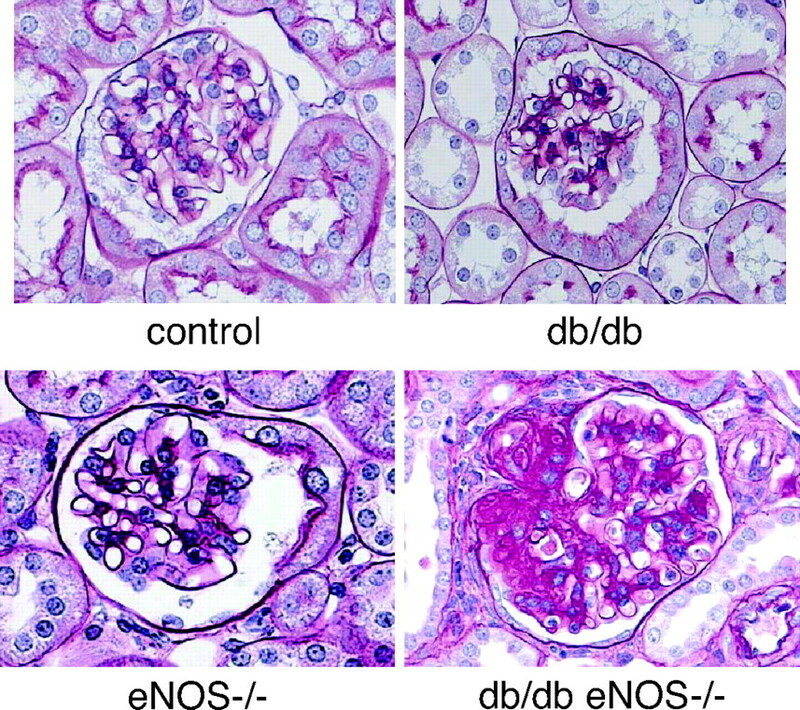 In general, BKS-eNOS−/− db/db mice exhibit more profound diabetic nephropathy than the low-dosage STZ diabetic B6-eNOS−/− mice. This divergence between strains may result from strain differences (nephropathy-resistant B6 versus nephropathy-sensitive BKS) or could reflect differences in pathologic responses to endothelial NO deficiency in type 1 versus type 2 diabetes. To address this question, AMDCC investigators are examining diabetic nephropathy in type 1 diabetic eNOS−/− mice crossed onto other nephropathic strains (DBA/2J and KK/HIJ, JAX #2106). Currently, eNOS−/− mice are available on B6 (JAX# 2684), BKS-db/db (JAX# 8340), and BALB/cBy (JAX# 7073) backgrounds from The Jackson Laboratory. Representative glomerular histology at 24 wk of age from eNOS+/+m/m (control) mice, eNOS−/− m/m mice (eNOS−/−), eNOS+/+db/db (db/db) and eNOS−/−db/db (db/db eNOS−/−) mice. All mice are on the BKS background. Note the markedly increased mesangial expansion and glomerulosclerosis in the BKS eNOS−/−db/db mice. Several groups have reported an association between the onset and progression of type 1 diabetic nephropathy in humans and the D allele of the angiotensin-converting enzyme (ACE) gene.28,29 In addition, ACE inhibitors and angiotensin receptor blockers are mainstays of renal protection in human diabetic nephropathy. In mice, a 50% increase in ACE gene expression has minimal effects on BP and angiotensin II levels but leads to substantial decreases in bradykinin, suggesting bradykinin rather than angiotensin II is more important in renal responses in diabetes30,31; therefore, AMDCC investigators have studied the contribution of targeted deletion of the bradykinin 2 receptor (B2R) to the evolution of diabetic nephropathy in Ins2Akita/+ mice on a B6 background.32 By 6 mo of age in this model, chronically diabetic Ins2Akita/+ mice with homozygous deletions of Bdkrb2 (the gene coding for B2R) develop a four-fold increase in albuminuria and profound mesangial expansion that resembles the glomerular changes seen in human diabetic glomerulosclerosis. There are no changes in the glomerular endothelial cells or podocytes. The mice also develop mitochondrial DNA damage in the kidneys and other tissues suggestive of generalized senescence.33 Although the mechanisms of enhanced nephropathy in this model remain unclear, there is normally a high level of B2R expression in mesangial cells, and knockout of these receptors is associated with enhanced renal expression of several genes involved in progressive glomerulosclerosis, including TGF-β1, connective tissue growth factor, and p53.33 The mice also have a substantial increase in expression of the bradykinin 1 receptor (B1R), but this does not protect them from developing nephropathy. Other investigators have reported similar findings. For example, treatment of diabetic rats34 and BKS-db/db mice35 with a specific nonpeptidic B2R antagonist shows reversal of almost all of the salutary effects of ACE inhibitors on albuminuria, glomerular extracellular signal–regulated kinase, and TGF-β signaling pathways and changes in glomerular gene expression. The antagonist also results in enhanced oxidative stress in glomeruli from treated diabetic rats. One exception to the general principle that activation of B2R protects against nephropathy has been reported in mice on a mixed 129S6/SvEvTac and B6 background made diabetic with low-dosage STZ.36 In that study, in contrast to the others, the B2R deletion was protective with respect to the mesangial expansion seen after 6 mo of diabetes and with respect to total excretion of albumin during the 6 mo. Nonetheless, by the end of the 6-mo period, the STZ diabetic mice lacking B2R excreted more albumin than STZ diabetic mice with intact receptor. Moreover, a marked increase in renal expression of B1R occurred in mice lacking B2R, and this could be sufficient to protect partially the low-dosage STZ diabetic mice but not the more severely affected Ins2Akita/+ diabetic mice. Subsequent studies by AMDCC investigators (M. Kakoki et al., unpublished observation) demonstrated that Ins2Akita/+ diabetic mice lacking both B1R and B2R have more severe nephropathy than Ins2Akita/+ mice lacking only B2R. The general importance of bradykinin and the whole of the kallikrein/kinin system in maintaining renal function was recently reviewed by AMDCC investigators.37 On balance, it seems that increased kinin levels after treatment with ACE inhibitors are protective with respect to diabetic nephropathy, whereas decreased levels (such as result from the D allele of the human ACE gene) are harmful. Decorin is a small, leucine-rich proteoglycan that is primarily secreted and stored in the extracellular matrix.38 In the extracellular milieu, it can have multiple functions by virtue of its ability to bind growth factors.39 Decorin can inhibit TGF-β activation by binding to the active form of TGF-β as well as regulate PDGF and epidermal growth factor (EGF) activity.40 Because decorin is consistently stimulated in diabetic nephropathy,41–43 AMDCC investigators evaluated the decorin null mouse as a potential model of progressive diabetic nephropathy. The decorin null mouse on a B6 background develops enhanced features of nephropathy as characterized by a 50% increase in mesangial matrix expansion and a 23% decrease in renal function over wild-type diabetic mice despite having only a modest 50% increase in urine albumin excretion.44 The diabetic decorin null mouse exhibits increased TGF-β levels and activity in glomeruli, as well as increased inflammation, marked by macrophage infiltration and upregulation of Nox444; however, the mice do not develop nodular sclerosis or tubulointerstitial lesions. Features of nephropathy in the diabetic decorin null mice diverge from those in diabetic wild-type B6 mice after 6 mo of diabetes, again suggesting that aging is an important aspect of progressive diabetic nephropathy. To determine whether decorin deficiency in the setting of hyperlipidemia further accentuates diabetic injury, AMDCC investigators evaluated the degree of disease in a double-null mouse for decorin and the LDL receptor. Despite a higher degree of LDL cholesterol, there is no evidence of worsening diabetic nephropathy on the basis of albuminuria, mesangial matrix expansion, or plasma creatinine levels in the diabetic double-null mice (K.Sh. et al., unpublished observation). NONcNZO10/LtJ (JAX # 4456) is an inbred congenic strain derived from a cross between the Nonobese Nondiabetic (NON/LtJ, JAX #2423) strain and the New Zealand Obese (NZO/HlLt, JAX# 2105) mouse, which provides a model of polygenic type 2 diabetes. NONcNZO10/LtJ male mice were developed at The Jackson Laboratory as a model of obesity-induced type 2 diabetes and metabolic syndrome resulting from polygenic interactions producing moderate obesity in contradistinction to the massive obesity elicited by mutations in the leptin/leptin receptor axis. In the NONcNZO10/LtJ congenic strain, the NZO/HlLt contributes segments from chromosomes 1, 4, 5, 11, 12, 15, and 18 onto the NON background.45,46 Male NONcNZO10/LtJ mice weaned onto a chow diet containing 10 to 11% fat (by weight) develop visceral obesity, maturity-onset hyperglycemia, dyslipidemia, moderate liver steatosis, and pancreatic islet atrophy. Notably, after approximately 8 mo of age, these mice also develop significant and progressively increasing albuminuria, with urine albumin-creatinine ratios >1000 μg/mg after 1 yr. Glomerular histopathology is impressively abnormal but, in addition to glomerulosclerosis, exhibits features that are atypical for diabetic nephropathy, including intraglomerular capillary thrombi and lipid deposition and evidence of Ig deposition. Moreover, several of these features, including the intracapillary glomerular lipid deposits and periarteriolar lymphoid infiltrates, have been observed in the nondiabetic NON parental strain47 and so seem to be unrelated to diabetic effects in this model. The FVB-OVE26 mouse (JAX # 5564) is a transgenic model of early-onset type 1 diabetes, generated directly onto the FVB/N background in the Epstein laboratory.48 These mice develop diabetes within the first weeks of life as a result of β cell toxicity in response to overexpression of an insulin promotor–driven calmodulin gene; however, like Ins2Akita/+ heterozygotes, a low level of β cell survival allows OVE26 heterozygotes to live and maintain their body weight well over 1 yr with no insulin treatment in the Epstein laboratory. In their studies of this model, Epstein and his colleagues report progressively increasing albuminuria that exceeds 15,000 μg/24 h at 9 mo of age in conjunction with hypoalbuminemia, high BP, and decreasing GFR.48 These animals develop progressively enlarged glomeruli, enlarging mesangium with diffuse and nodular expansion of mesangial matrix, tubulointerstitial fibrosis, and thickening of the glomerular basement membrane. AMDCC investigators have not yet examined FVB-OVE26 heterozygotes. Although re-derived stock is available from The Jackson Laboratory, high mortality was experienced both during shipment and by investigators shortly after receipt. Mice having a series of transgenes (RenTgARE, RenTgKC, and RenTgMK) on a 129S6/SvEvTac co-isogenic background exhibit progressively greater plasma renin levels, ranging from near physiologic to eight times normal, and develop graded kidney and cardiovascular disease.49 Urinary protein excretion in these mice ranges from normal to 10 times normal, and renal pathology at 6 mo ranges from normal to severe glomerular sclerosis with inflammatory cell infiltration and tubulointerstitial fibrosis together with proteinaceous casts. The cardiovascular phenotype is increased BP (up to 150 mmHg) accompanied by age-dependent cardiac hypertrophy and vascular fibrosis. AMDCC members have made the RenTgMK mice diabetic with low-dosage STZ or with the Ins2Akita/+ mutation, and find the proteinuria and glomerulosclerosis caused by the diabetes is dramatically increased by the greater renin levels (S.B.G. et al., unpublished observation). Although a number of genetic modifications and alternative strains have resulted in models of diabetic nephropathy that more closely resemble the human complication, there are a number of AMDCC models that do not result in worsening nephropathy. Some of these models have been surprises or have not always agreed with previously published models. The data for some of these models are discussed in the online supplement for this article, and data for all models are available on the AMDCC web site (http://www.amdcc.org). Some of the surprising negative models included diabetic mice with the following gene deficiencies, gene duplications, or transgenes, when compared with control diabetic mice on the same genetic background lacking such changes: B6-ACE2-deficient mice, 129S6/SvEvTac mice with an AT1 angiotensin receptor isoform gene duplication, B6-Sod2 (superoxide dismutase 2) heterozygous mice, B6 mice with podocyte-specific deficiency in the Sod2 gene, CD2AP (CD2-associated protein) heterozygous mice on a B6 background, and endothelial-specific receptors of advances glycation end product monotransgenic mice on a mixed B6 and CD-1 background. More details about each of these models and possible explanations for their lack of efficacy in producing accelerated nephropathy are contained in the online supplement. As noted already, AMDCC investigators and other investigators in the field have yet to validate a complete murine model of human diabetic kidney disease. Nonetheless, the critical analysis of extant murine models by the AMDCC and others has substantially enhanced our understanding of this nephropathy during the past few years. Perhaps the most obvious insight derived from this work is the confirmation that genetic background has a profound effect on the evolution of disease. Although this has been clear from human studies,50–54 the degree of difference in glomerulopathy between inbred mouse strains is remarkable, even between those that share most genetic information (B6 and BKS mice). Of all genetic backgrounds tested or reported so far, the DBA/2 mouse is most susceptible to diabetic glomerulopathy, whereas the B6 mouse seems to be the most resistant. Emerging studies regarding the 129S6/SvEvTac and KK/HIJ strains also support the potential utility of these strains in the study of diabetic nephropathy. The role of environmental factors, including diet, caging, light cycle, handling, gut microbiome, and pathogen exposure, has not been addressed comprehensively. Nonetheless, it is clear that environmental factors have a major impact on disease phenotypes. For example, AMDCC investigators (F.C.B. et al., unpublished observation) and others find that the fat content in the diet can have a marked impact on the degree of hyperglycemia found in B6-db/db mice (but not in BKS-db/db mice). B6-db/db mice on a standard chow that contains only 4% fat (wt/wt) exhibit only transient hyperglycemia and still become obese, whereas those on as little as 8% fat maintain hyperglycemia as well as obesity. Whether differences in environmental conditions can lead to differences in the phenotype of diabetic nephropathy has not yet been reported. Another key conclusion from findings from AMDCC and other investigators is that abnormalities arising in each type of glomerular cell (endothelial cell, podocyte, mesangial cell) as well as a number of extraglomerular cells play important roles in the evolution of diabetic glomerulosclerosis. Whereas historically most studies focused on regulation of mesangial cell extracellular matrix and the involvement of these cells in the pathogenesis of diabetic nephropathy,55–57 more recent reports indicate that isolated podocyte damage and loss58,59 lead to glomerulosclerosis and that podocyte loss is a requisite early event in diabetic nephropathy.60–63 In addition, models of endothelial dysfunction result in glomerulosclerosis,24,25,64–68 suggesting, not surprising, a substantial cross-talk between endothelial and mesangial cells. Indeed, mice with a targeted mutation in the Nos3 gene encoding eNOS24–27 is the most robust model of diabetic nephropathy on a number of genetic backgrounds. This nephropathy presumably results from endothelial cell abnormalities in the glomerulus and possibly the tubulointerstitium. This model is one of the very few to develop appreciable degrees of tubulointerstitial fibrosis, a critical lesion of progressive diabetic nephropathy. Finally, there is reason to believe that extraglomerular cells, such as bone marrow–derived mesangial cell progenitors69 and macrophages,70,71 significantly contribute to diabetic glomerulopathy. Perhaps one of the most significant findings of the AMDCC is that only a limited number of monogenic changes in gene expression (eNOS−/−, B2R−/−, and renin transgene) substantially worsen diabetic nephropathy, and none of those monogenic models fully recapitulate human disease. Thus, monogenic changes in gene expression are likely to be insufficient to induce full-fledged diabetic nephropathy, at least on the resistant B6 background. The section on negative models in the online supplement and the results in the archived model database on the AMDCC web site (http://www.amdcc.org) document the relative lack of effect of reduction in antioxidant defenses, increased glucose transport, increased advances glycation end product receptors, and other changes that resulted from the manipulation of expression of candidate genes. A final repeated theme has been that aging is a critical feature of even the best mouse models of diabetic nephropathy. Aging of diabetic mice to ≥12 mo may be required for consistent development of diabetic nephropathy in many of the models heretofore evaluated by AMDCC investigators and others. This theme seems to hold in the diabetic DBA/2 mouse, as well as the diabetic eNOS, B2R, and decorin null mice. It is supported by the phenotyping of the Ins2Akita/+ diabetic mice on various backgrounds, where highly variable kidney histopathology suggests that lesions are just beginning to develop at 6 mo of age. Effects of the gender of the animal seem to be much less clearcut. Although the severity of nephropathy in many spontaneously diabetic animal models (db/db and Ins2Akita/+) is generally less in females than in males, this could be due to the lower blood glucose levels in females as well as to differences in body weight or food intake (K.S. et al., unpublished observation; AMDCC archival database: http://www.amdcc.org). It is clear that further research is needed to define gender differences in diabetic nephropathy in rodents and humans. Although the AMDCC has made vital progress during the past 8 yr toward developing better models of diabetic complications and has helped advance the understanding of human diabetic nephropathy, there remains much to accomplish. Although it is difficult to predict the directions of future research that are most likely to drive our understanding forward, there are several aspects of this enterprise about which it is tempting to speculate. First, it seems likely that a combination of sophisticated comparisons between murine models and humans with diabetic kidney disease may promote relatively rapid development of new ideas and models. The focus on candidate pathways, although informative, has for the moment clearly limited the ability to expand our understanding of the nephropathy. A more unbiased approach to identification of pathways and networks of abnormalities in diabetic nephropathy and other complications seems likely now to be well suited to expand our understanding. One recent example of an unbiased approach used a transcriptomic analysis of both humans with diabetic nephropathy and mouse models of the disease to uncover a signaling pathway that may be important in diabetic nephropathy.72 This AMDCC study found high levels of many JAK/STAT family members in humans with progressive diabetic nephropathy but not in STZ diabetic DBA/2 or BKS-db/db mice with the relatively mild kidney disease seen in these models. Activation of JAK/STAT signaling may be important in human diabetic nephropathy, and induction of such signaling in mouse models might accelerate complications. Similar approaches are being taken by other AMDCC investigators to identify new pathways. Importantly, it is likely to be difficult to generate a single mouse model that recapitulates all of the features of human diabetic nephropathy. Perhaps rather than continuing the search for this holy grail, we should settle for a suite of mouse models that recapitulate individually the findings of the human disease. Each of these models individually will teach us something new about the multiple molecular abnormalities that together produce this deadly diabetic complication. In the event that human genetic variants that account for a major percentage of diabetic nephropathy are identified, it will be possible to use a susceptible strain such as DBA/2 as a building block to “knock-in” the human diabetic nephropathy risk variant into the orthologous mouse gene. This work was supported by National Institutes of Health Grants (AMDCC): U24DK076169 (R.A.M. ), U01DK061018 (R.C.H. ), U01DK076139 (F.C.B. ), U01DK076133 (K.S. ), U01DK076136 (T.M.C. ), U01DK060995 (E.P.B. ), U01DK076134 (M.L. ), U01DK076131 (O.S. ); MMPC grant: U01DK076126 (C.A.). We thank the AMDCC External Advisory Board (Drs. Thomas Hostetter, John Sedor, Juergen Naggert, Phil Tsao, and Doug Zochodne) as well as Dr. Helen Nickerson (Juvenile Diabetes Research Foundation International) for advice and support. We also thank Peter Reifsnyder and Racheal Wallace (Type 1 Diabetes Resource/AMDCC Core at The Jackson Laboratory) for phenotyping data in Figure 3. Finally, we thank the heroically committed AMDCC program staff, Drs. Chris Ketchum (National Institute of Diabetes and Digestive and Kidney Diseases), Kristin Abraham (National Institute of Diabetes and Digestive and Kidney Diseases), and Cristina Rabadan-Diehl (National Heart, Lung, and Blood Institute), for unwavering support and guidance. Uromodulin and Translational Medicine: Will the SNPs Bring Zip to Clinical Practice?